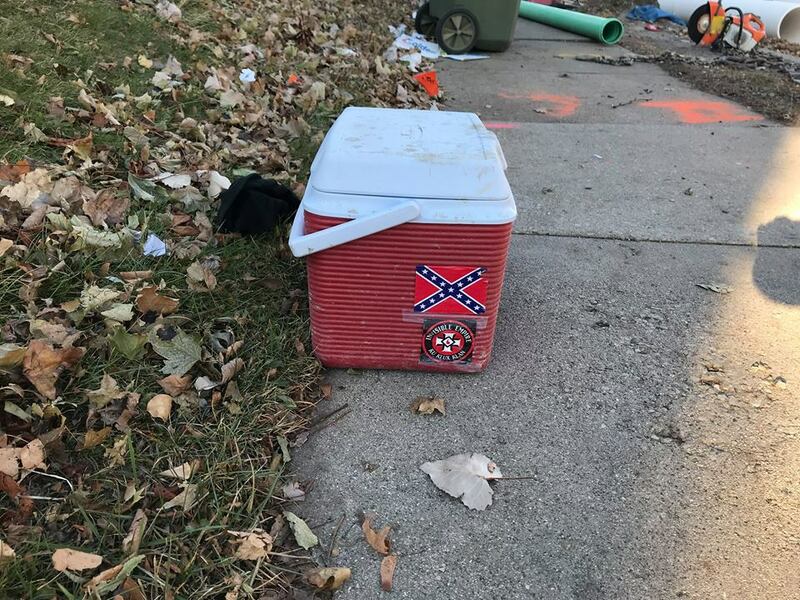 American Sewer Services, a city contractor, has fired the employee responsible for bringing a cooler with Ku Klux Klan and Confederate Flag stickers to a city sewer job site at N. 25th St. and W. Wells St. The white supremacy image was the second problematic incident for the Hartford, Wi-based American Sewer Services in as many weeks. A November 30th photo caught three of its employees openly carrying guns on a city job site, with one having removed their weapon from its holster. Those employees were disciplined, with the one brandishing the firearm reportedly terminated. The cooler was discovered by Sam Singleton-Freeman and posted to Facebook as part of a series of images. Department of Public Works Commissioner Ghassan Korban emailed select members of the Common Council this morning to inform them “I have spoken to the contractor several times over the weekend . He fired the individual who owns the cooler. I suspect that will become an issue for him given the individual fired belongs to local 113 laborers.” The worker was likely subject to a seasonal layoff in the coming days as everything but emergency sewer work is suspended for the winter. According to the Laborers Local 113 website, the union represents over 2,500 members in Milwaukee, Waukesha, Racine, Kenosha, Ozaukee, and Washington counties. Area alderman Robert Bauman, who lives just blocks from the job site, on Friday criticized American Sewer Services: “Obviously this contractor has a problem recruiting employees who are comfortable working in Milwaukee,” he told Urban Milwaukee, adding that he expects a discussion by council members about bringing the contract work in-house so the city could focus on hiring city residents to do it. According to the 2010 US Census, 40 percent of city residents are of African-American descent, while 17.3 percent are Latino or Hispanic and 3.5 percent are Asian, while 37.5 percent are white. The city is considering legislation to ban contractors from carrying firearms, similar to regulations for city employees. Urban Milwaukee’s calls to American Sewer Services asking for comment were not answered. Republicans have seriously gone off the deep end with their enabling and/or outright support for pedophiles, the Confederacy, Nazis and Trump’s crypto-fascist authoritarianism. Thank you Terry. Very insightful and relevant commentary. The problem stems from company ownership/management. They undoubtedly haven’t established any rules of conduct for their employees. Or, if they have, they don’t oversee or enforce them. The KKK is vile, reprehensible, and its supporters are undeserving of any respect. An individual who supports any activist, political, or religious organization has a right to do do on their own time, but employers and customers should expect that the work envirionment should be totally free of such influences. Keep your “Trump”, “Hillary”, “KKK”, “Walker”, “Recall-Walker”, “Jesus Loves You”…and other ilk out of the workplace. Inept management at American Sewer Services, Inc. and Union Local 113 apparently condoned the action of the reckless employee– and they should be judged accordingly. @Mike, thanks! This disgusting turn that the republican party has taken under Trump has emboldened and even condoned this type of behavior. I hope voters remember that come election time and vote out the enablers and all the toady’s for Trump within the republican party. Paul Ryan included. This racist madness needs to stop!